I cry when I remember that one morning when he took his right hand in my left, and his left around my waist, and slow danced in my kitchen to silence after I'd just spent several minutes raging over an angry email from my ex. Now, all I can think about is how those rough hands softened me time and time again. On our first date he sat across the booth from me at Outback Steak House and over a Blooming Onion he said, "I bet you've never dated a guy like me." He held up his fingers, palms toward him, fluttered them and said, "A guy with dirty fingernails." He was right. I hadn't. I'd recently left an eight year marriage from a soft-handed man. My now ex-husband was hygienically conscious and washed his hands after every meal, every task, lotioning them up in the dry winters. My ex-husband's fingers, like mine, typed on a computer all day. 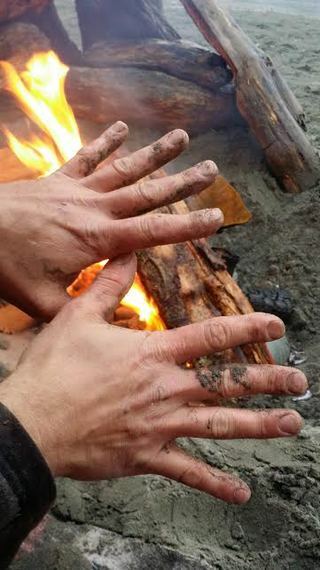 They didn't smooth wood or grout tile or carry stacks of lumber and crack from overuse like this man's hands. This man's hands were tools fastened to his wrists. They were like giant boulders on the end of steel rope; mangled, filthy, misshapen and torn to pieces. At this point in my journey, I wanted different hands. Then one day, he took his hands and he built my toddler son's "big boy" bed. He took large rails of oak from his own childhood bed and he fastened them to a frame. When he watched me look sentimentally at my son's dismantled crib, he waited until I was gone, and then took a piece of it and used it for a headboard. Back then, in the beginning, I didn't even know how to make him understand how much it meant to me. Over 9 months, I'd get to know those hands pretty well. They held me so kindly while I sobbed in some of my worst moments of despair. One evening, when I was too weak and sad and scared to move from my bed, he took his hands and he brought me my shoes. He gently opened the tongues, undid the laces and he slipped them on my feet. Then he took both his hands and lifted me up, off that bed, and he made me live again. And again. And again. Sometimes, as we lay together at night I would take his big, rough, more-knuckle-than-phalange fingers and I would run the pads of my thumb over his thumbnails. They were as flat as sanded pine. He'd laugh and say, "My thumbnails are permanently flattened from hitting them with a hammer so many times." Oh I loved that about him. And I loved those thumbnails. They were my favorite part of those tough, gnarled, gentle hands. With those hands he's built homes, not just houses. With those hands he black-belted in more than one martial art but never talks about it. Those scratchy and knobby fingers held his newborn baby girl against his chest, and after watching YouTube videos, those stiff fingers braided her long, 10-year-old hair. Although he could so easily, he'd never use them to hurt her, or me, or anyone, really. A few times, toward the end, when I was finally seeing the beauty of his hands, he'd come home from working hours and hours on someone else's house and he'd have cracks in the skin on his fingers that ached horribly. I'd inspect them, go to the medicine cabinet and retrieve anything I could find to make the pain go away. He smiled so sweetly when I covered his wounds with Sleeping Beauty band-aids. I'd ask him if it felt better and he said no, but it will tomorrow. He left because he feels like his hands aren't good enough for mine. He left because his hands are as empty as turned over buckets and he's afraid of how that emptiness will hurt me. Nothing I say will convince him that his hands are enough. And now, all I can think about are all the things his hands have done. And now I cry for different reasons. I cry when I remember that one morning when he took his right hand in my left, and his left around my waist, and slow danced in my kitchen to silence after I'd just spent several minutes raging over an angry email from my ex. Now, all I can think about is how those rough hands softened me time and time again. He asked me why I wanted a picture of his hands. I wasn't able to convey all the reasons why, but it was because I loved them, and appreciated them, and I knew I might never see them like that again. I needed that memory. Those huge, hard-as-stone hands could build anything, fight for anyone who needed it, and yet... I know he would never use them to hurt me. In the end, he was right, I'd never dated a man like him. But someday, I hope I might again.